I was very happy to see this response from the newly-formed coalition at Berkeley to the stupid College Republican bake sale. As College Republican groups have been doing for years, the Berkeley group decided to sell cupcakes at different prices to people of different races to make some kind of facile point about affirmative action. The thing about the Republican stunt is that it’s stupid, and intentionally so, which makes it difficult to know how to respond. 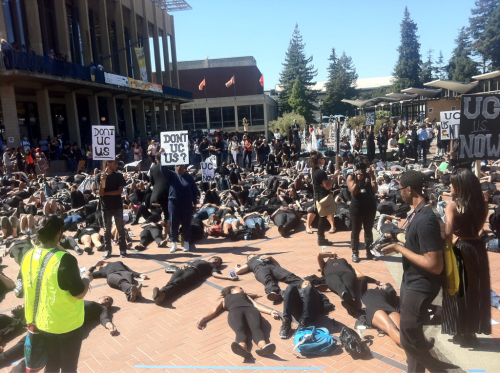 The coalition, as it turned out, had the right strategy – ignore the ten racist wankers with cupcakes, and organize a few hundreds students, mostly of color, in a striking demonstration of their visibility on Sproul Plaza. Don’t engage with the idiots, just show how pathetic and marginal they are. One reason why Fascism has a chance is that in the name of progress its opponents treat it as a historical norm. The current amazement that the things we are experiencing are ‘still’ possible in the twentieth century is not philosophical. This amazement is not the beginning of knowledge—unless it is the knowledge that the view of history which gives rise to it is untenable. It’s no accident that the description of contemporary racism in terms of past racism appeals to progressives, because the structure of the argument is itself progressive; that is, it suggests that there is a natural tendency for things to get better, and things which are bad are bad because they are outdated. This view presents racism as an atavism, and, in doing so, actually downplays the importance and persistence of racialized inequality; racism, it suggests, should have ceased to exist some time back in the 50s, but mysteriously has failed to do so.